Mid-continent populations of light geese are currently at levels never before recorded. They have surpassed critical mass and efforts to stem their growth over the last 20 years has been ineffective. 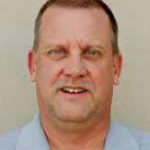 “It’s a difficult concept to explain,” said Casey Cardinal, turkey and upland game biologist with the New Mexico Department of Game and Fish. “There’s a threshold, or the number of animals a particular habitat can support called the carrying capacity. Some of the light goose breeding populations have exceeded that point. Habitat and birds suffer as light geese numbers rise. NMDGF photo by Dan Williams. It’s both a testament to modern wildlife management practices and the unanticipated role humans can play within the ecosystem, she said. Just a century ago, as market hunting was outlawed and modern wildlife management entered the scene, the snow geese population was imperiled. The species was on the brink of extinction. Numbers were so low, hunting of snow geese was banned in the eastern United States in 1916. Six decades later, in 1975, the population had rebounded and hunting the geese once again was allowed. Despite the return of legal hunting of snow geese, more birds continued to enter the population than were being removed and researchers began documenting a steady 5 percent increase in numbers each year. That increase is exponential. At one million birds, 50,000 are added to the population; at 5 million birds, it’s a 250,000 increase the following year. A population of 10 mil-lion will add a million birds the next year. Currently, the estimated number of light geese using the Alaskan and Canadian breeding grounds has exceeded six million birds. These birds fly north to summer nesting areas, especially around Hudson Bay and James Bay in Canada. Snow geese have strong, thick bills that work well in grubbing, a feeding practice in which a goose will probe below the surface and turn soil over in search of nutritious plant roots. “These large populations need a lot of forage, so they end up removing excessive amounts of vegetation,” Cardinal said. 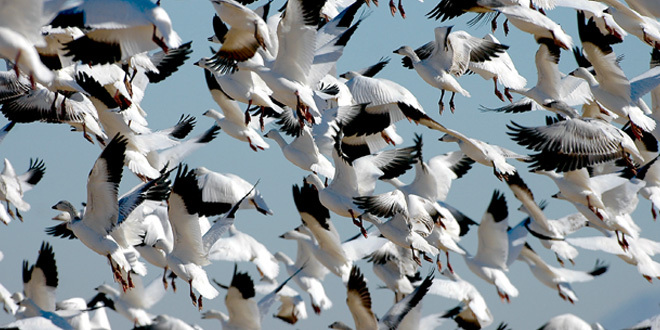 Above: Once imperiled, snow geese are now at population levels never before recorded. The numbers are so high, biologists believe as the birds destroy habitat, they are impacting other wildlife. NMDGF photos by Dan Williams. With limited breeding areas and a short growing season, the snow geese are devastating important habitat, not just for them, but for other species as well. And the situation isn’t getting better.Re-searchers first began documenting habitat degradation in 1996 when a 1,200-mile stretch of coastline was surveyed along west Hudson Bay and James Bay. Those researchers estimated about 35 percent of the original habitat was destroyed, 30 per-cent severely damaged and 35 percent was overgrazed. The U.S. Fish and Wildlife Service began reporting about potential negative impacts to many species in 1999. Cardinal said some impacts can be a loss of nesting habitat or a diminished food supply, two of the key components for the breeding cycle. In modern times, with many human impacts on the environment, it isn’t often biologists have had to explore the causes for such a population explosion. In just 100 years this bird has gone from nearing extinction to numbers so high they are impacting other species. Wildlife biologists believe there are several reasons for the continuing upward trend with light geese. Near the top of that list is available food sources during periods of migration. 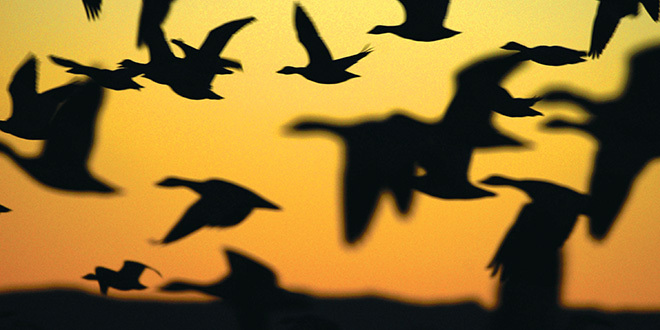 There was a time when a number of birds would die during a long, difficult migration. However, large farms and an ever-expanding wildlife refuge system has made the journey less hazardous and food more plentiful. As a result, survival rates have increased and lifespans have improved. In addition, light geese are intelligent. When hunted, they simply adapt and end up in new locations, in areas difficult to access or where hunting is not allowed. They’ll also scatter following the first shot-gun blast. While it might seem to be simple with so many birds, when all these factors are combined it makes for a difficult and frustrating hunt. And, each bird killed must then be cleaned and eaten. This means supply far outweighs demand. Another reason is that the geese are living longer than ever. The lifespan of a goose can range anywhere from 8 to 20 years. They reach breeding age at 3 and, with the average female laying four eggs, it means if one lives to just 8 years old, she’ll have produced 24 goslings. If that female lives to 15, that’s 48 goslings. While some considered letting nature run its course, biologists believe that could be disastrous. While hunting has been a management tool, it was clear by 1999 that the annual increase in snow geese was outpacing the number removed through traditional hunts. 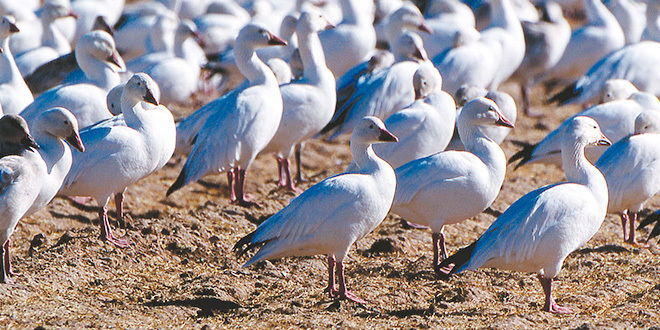 Above: While thousands of snow geese may winter in New Mexico, the problem lies at their summer breeding locations in Canada, where millions are sharing a limited amount of habitat. NMDGF photos by Dan Williams. As a means to encourage additional participation and take, the Fish and Wildlife Service liberalized the rules and allowed states to institute conservation measures aimed at reducing the light geese population. This action included the ability to adjust hunting regulations to allow for the take of light geese beyond the regular waterfowl season. In New Mexico, when the general waterfowl season ends in both the Central and Pacific Flyways, an extended season for light geese begins. Also approved during this extended season was the use of electronic calls, unplugged shotguns and shooting until a half hour after sunset, except at Game and Fish Wildlife Management Areas. “The conservation order has helped to reduce the rate of population growth, but the number of light geese is still increasing,” Cardinal said of the 1999 changes. “They are incredibly wary and will quickly adapt to avoid harvest. Hunters that experienced early success found the geese to be a more difficult hunt in the following years. Biologists have no doubt that without intervention the ecological damage will continue to worsen. Hunting is ideal because the birds are legally taken, cleaned and consumed. Other methods, such as trap-and-cull are not viewed as favorably after spending so many years focused on recovery. The only thing biologists know for sure is that sitting back and watching isn’t working. The birds continue to grow in numbers, destroying one breeding ground and moving on to another.